Dressed only with a cloth around his waist and beads across his chest, Keshava Das sits cross-legged beside the Ganges like millions of other believers drawn to India's sacred river. But Das is a pale 40-year-old German living in the city of Stuttgart -- and he says the Kumbh Mela ("Pitcher Festival") represents all that is right about Hindu culture, in contrast to the Western, capitalist way of life. "The wisdom here is something you can't find elsewhere," he said. "I lived in India for many years, and still maintain strong spiritual relationships with the sadhus (holy men) that I came to know then." Das -- who uses his adopted Indian name and declined to reveal his birth name -- is one of hundreds of foreigners drawn to three-month Mela, which is billed as the largest religious gathering on Earth. "This is a very important event and the thinking here is open and profound," said Das, who sports long blond dreadlocks and spectacles. 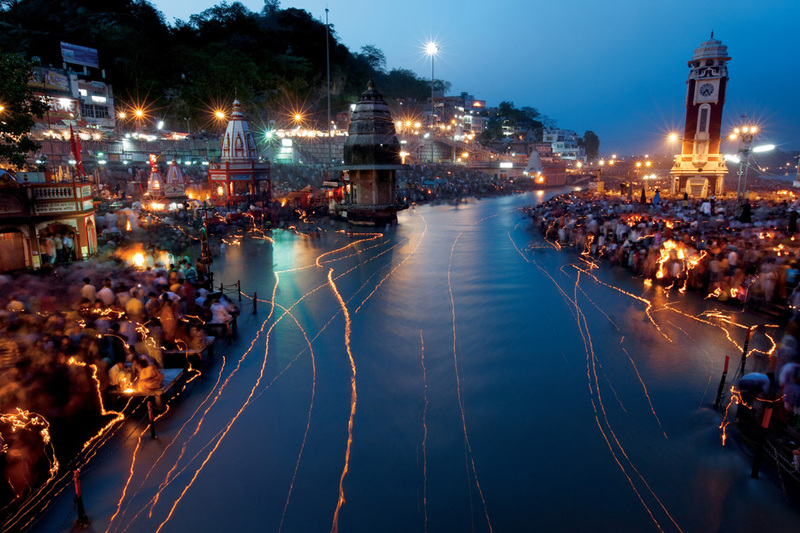 His friend Prema, also from Germany, said she had bathed every day in the Ganges during her visit to Haridwar city, where the three-month festival is being held. "To go into the river is simply transformative," she said with a wide smile. "Please, I beg every foreigner to also enter into the water to discover what it is like." Ten million people immersed themselves in the Ganges around Haridwar at the Kumbh Mela's climax on Wednesday, and foreigners amid the crowds of devotees said they came for reasons ranging from spiritual longing to simple curiosity. Flora Pons, 21, and her mother Clodin, from Arras in France, were fascinated by the festival but also found it a tough experience. "It is unbelievably crowded, as well as dusty and hot," Flora said. "Seeing so many religious people is amazing -- even if I think some of the gurus are crazy and fake." Many foreigners sleep in the pilgrim encampments that have sprung up around Haridwar, while others find one of the few hotel rooms available or just bed down in the open. "When we arrived we met a guru who immediately invited us to stay with him and his followers," said Julia Timusheva, 23, from St Petersburg in Russia. "Millions of people are here because they believe the water is special, and I believe it too," she said, still dripping from her "holy dip" on Wednesday -- the most auspicious day of the festival. Her fellow bather, Ethan Wool, 20, from Austin, Texas, said he was amazed at the amount of pushing in the crowds but he said he still felt foreigners were happily accepted by the Hindu faithful. "The women push the hardest -- perhaps I am just not used to it," he said.